At the first public showing of a movie picture depicting a train coming toward the viewers, people scattered in alarm trying to get out of the way. Or so the story goes. Some will do the same with director Peter Jackson’s new film The Hobbit: An Unexpected Journey. The irony is that The Hobbit’s titular character, Bilbo Baggins, doesn’t like to take risks in a film that revels in them. It’s visionary stuff, and Jackson is alone on the frontier with only James Cameron visible on the horizon. 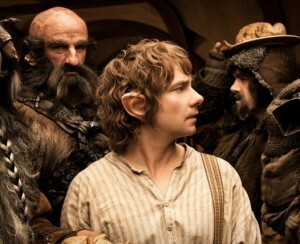 The first installment of The Hobbit trilogy is new cinema. Instead of playing safe and comfortable in lower-risk financial zones, Jackson has pushed the boundaries with 3D, with 48 frames of film per second -– or the digital equivalent — flashing past viewers’ eyes instead of the traditional 24fps. It is definitely different. The filter of the traditional look of cinema, what we are used to seeing in the dark, is gone. Forever? Consumers will ultimately decide but studios continue to churn out films in 3D despite anything but universal acclaim. Here, Jackson has gone to such lengths to make the fantastic look real that for many the film will look unreal -– but only if viewers choose to see it in the director’s preferred way. Of the approximately 24,000 theaters that will display The Hobbit: AUJ, around 1,000 will have the technology to display it as it was shot — HFR 3D. But, for those 1,000, hang onto your arm rests, cinema has just leapt forward. Bilbo Baggins (masterfully portrayed by Martin Freeman in a performance that will be lost amidst the eye-popping action sequences), as many readers will know, relishes his comfortable life in the cinematically familiar Bag End. He is interrupted by a gaggle of dwarves and a meddlesome wizard who for reasons he cannot himself explain, thinks Bilbo needs to travel with the dwarves. All of this is familiar ground for readers of Tolkien’s original tale. And, as expected, the screenwriters (Fran Walsh, Phillipa Boyens, Guillermo del Toro and Peter Jackson) make great effort to up the stakes and ramp-up the tension. People who haven’t been paying attention to the promotional lead-in campaign may be surprised to find that joining Freeman and Ian McKellen’s Gandalf as lead characters in the film is Richard Armitage as Thorin Oakenshield. It’s a role likely to launch Armitage, blessed with an already-fervent fanbase, masculine good looks, and ample ability, into the stratosphere. The character is deeply scarred and tragic. Thorin gives the children’s tale a Shakespearean disaster angle and the film makes the most of it in in ways that may not surprise viewers but will nevertheless delight them. 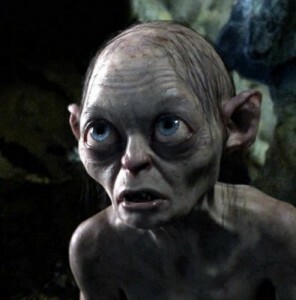 Andy Serkis returns to work his performance-capture magic as Gollum, and Jackson and his actors reach the peak of performance and technical … well … wizardry in a scene that is the film’s best. Despite being dialog-heavy, it is cinematic magic. So Bilbo, content to play it safe in a movie that most definitely isn’t, is joined by all these dwarves who despite excellent design and characterization, just don’t have enough room in the movie. Considering Jackson’s Middle-earth legacy, many viewers will immediately begin pondering extended editions and hope for more from these characters. Then -– especially if they see it in 48 fps -– they’ll want to schedule another viewing. This writer’s initial reaction to the film was wanting to see it again immediately. As of this writing, that has been impossible. Fans, and those who care about film as an art form (and perhaps as a science) will want to view The Hobbit: An Unexpected Journey in both its incredibly clear new format and as a traditional film. Others, the Bilbo Baggins of the world, are perhaps better advised to simply see the film as they saw The Lord of the Rings. They will be thrilled with adventure and the interplay of now-familiar movie characters playing again inside the incredible landscapes of Middle-earth. Peering deeper into dwarven culture will come with a (pun-intended) deep satisfaction and they will be thrilled, despite some dark days for fans, back in a delightful rendition of Jackson’s Middle-earth.. It goes without saying that not everybody will like everything. Setting aside technology for a moment, sections of the film that delight some will frustrate others. In one place Gandalf reuses a familiar story-telling device. For some that will hearken back to the familiar. For others it will seem like a rehash. There are a handful of such moments. The 100% CGI orc Azog may feel cartoon despite (or because of) his technical perfection; he is no Gollum. But putting aside the quibbles, Jackson has delivered a tightly paced action flick that is rollicking fun. He has captured again the magic of Tolkien’s world with his own stylistic, cinematic stamp. Radagast the Brown is a delight and injects some of the fringe legends of Tolkien’s own hand and some of the lighter tone of the source material into the sometimes dangerously heavy Middle-earth. There is the expanded Goblin Town with its madcap action – more jolly than peilous – which takes license with underground kingdoms. But amidst all this fun we are tossed a dozen decapitations as well creating a puzzle for some parents and sensitive younger viewers. Cate Blanchett casts her graceful spell along with the most welcome Christopher Lee and appropriate the slightly less stressed Elrond from Hugo Weaving, iconic in his own right. The dead-on casting with exemplary performances from the leads as well as those in small roles make the fantasy feel real more than any technician can -– and the technicians on this film are world-class here. And yes, fantasy films can have exemplary performances and actors selling the fantastic as the everyday, have achieved high-craft in their art. Technically masterful, this adaptation of a classic children’s tale is grand and glorious cinema that is indeed lighter than its Rings cousin but also with nasty battle elements. What’s more, any discussion about the need for three films or the making the decision to do so based on anything but storytelling merits couldn’t be more incinerated if Smaug himself engulfed the conversation in dragon’s fire. The case for three films is settled. But being first is difficult. Like Ebay selling its first item in 1995 (a laser pointer if you must know) new things can take a while to catch on. The lion’s share of reviews are going to address the step forward in display technology (including this one!) but the story will sink or swim because of the characters, their situations and the craft with which they are brought to life. 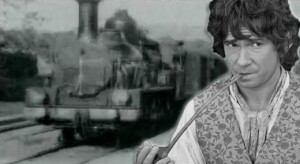 Viewers need to evaluate: Are they Bilbos? Do they want safe, familiar cinema or do they want to go on an adventure at the theater? The comparison isn’t mine originally but I like best the thought that somebody has taken the window out and now we are not looking through the filter of film but looking at the real world. It will take some adjusting. Will you like it? Well, do you embrace change? Can your entertainment tastes evolve? This is like nothing you have ever seen and it will jar not just your eyes but your brain. The dragon slayers will revel in the new and the adventure. Not every note will ring true for every viewer but whatever else, this movie is about fun and adventure. And (something that will obviously delight the studio) the real answer to this riddle is that this is a film that cries out to be seen in both formats and compared by the viewer. It is entertaining entertainment but it is also a landmark of technology and a test of crowd behavior. I agree with Jackson and Cameron; this is the future. Whatever the public and critics conclude, Jackson and his team must be admired for operating on wires high above the crowd with no net or safety line with fearlessness and passion. As for me, I will take that at my cinema experience every time over another action film content to play it safe. NOTE: Larry D. Curtis spent five weeks on the set during film of The Hobbit and freely acknowledges his opinion of this film is compromised. Further, he is dying to see the film again to have a more informed opinion. 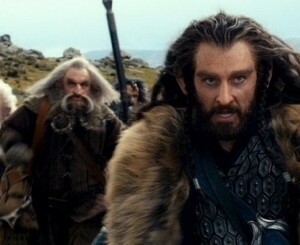 The Hobbit’s dwarves: Too hot to handle?